Below I have started to group together documents, articles, photos and websites specific to Nan through to William RN Beach Commandos. In each case the first link shows an account of that commando from the History of Naval Beach Control Parties (formerly Royal Naval Beach Commandos) from the National Archives. These accounts were written between the 18th of March and the 1st of April 1946 after the 'great spring clean' so there maybe a few anomalies.Two other pages from this document show when each unit was formed and where they were deployed at intervals. NAN Commando August 1944 at Porto San Giorgio, circled is Petty Officer Raymond Henry Seaton DCM. Naval Beach Party N (Nan) were formed at HMS Armadillo in the latter part of January 1943* under Lt Maurice Vernon Redshaw RNVR who had commanded G2 of Naval Party George in North Africa. Nan were the second NBP to be formed at HMS Armadillo, M (Mike) being the first. Sub Units N1 and N2 were formed initially with N3 following nearly a week later. *During their initial training they embarked on HMS Keren on the 16th of February for four days of exercises then on completion of their training at HMS Armadillo in early March 1943 they went on ten days leave (An * indicates dates from Beach Commando Weekly State reports). N1 and N2 reported to HMS Foliot 111, Bickleigh Devon on the 10th of March with N3 reporting on the 16th* for further training which included an assault course by the River Plym, that they had to first build. On the 30th of March 1943 they left Bickleigh Station arriving at Spean Bridge on the 31st of March, from there marching to the Commando Training Centre at Achnacarry, Lochaber where they would do the commando stage of their training. Nan were the first Naval Beach Party to undertake commando training at Achnacarry. The records at the Spean Bridge Museum show that there were 11 officers and 68 other ranks trained in the 'N' Beach Commando batch and that their commando training was completed on the 9th of April 1943 in just under two weeks as opposed to the normal six weeks. 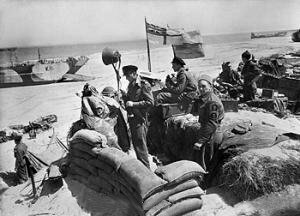 During this period their unit title changed from Beach Party to Royal Navy Beach Commando and they also came under the command of a “Primary Beachmaster” (PBM), Acting Cdr P.W.F Stubbs DSC RN, who was awarded the Distinguished Service Cross, for his part in Operation Torch in North Africa the previous year. After Achnacarry Nan Commando went HMS Rosenheath and in the latter part of April they were attached to Force 'V'*. A period of leave followed from May 2nd to the 8th after which they returned to HMS Rosenheath until the 25th of May 1943 when they left for HMS Armadillo. There they stayed until the 1st of June when they left for a series of exercises during which they were inspected by the Chief of Combined Operations Vice Admiral Lord Mountbatten. Then on the 10th of June N1 embarked on HMS Glengyle, N2 on the Netherlands ship SS Marnix Van Saint Aldegonde and N3 on HMT Derbyshire and after some exercises off the Isle of Arran they sailed from the Clyde in the fast assault convoy KMF18 as part of force 'V' for Sicily on the 29th of June 1943. Because of storms at sea whilst approaching Sicily KMF 18 anchored half an hour late and slightly eastward of it's planned release position in their designated sector Bark West on on "D-1" the 9th of July 1943 (The London Gazette - The Invasion of Sicily). On "D-Day" July 10th 1943 Nan Commando landed in Sicily with the Canadian Division near Pachino in Roger sector of Bark West, N1 commanded by Lt John Blakely Russell DSC RN on Red Beach, N2 commanded by Lt Maurice Vernon Redshaw RNVR on Green Beach and N3 commanded Lt Thomas James Turton RNVR on Amber Beach. On "D+2" Nan Commando took over Sugar sector of Bark West in addition to Roger Sector but by 20:30 on "D+4" Wednesday the 14th of July all ships were clear of Bark West and it was closed down though work continued there to salvage damaged craft. Then on the 16th of July Nan Commando moved to "Beach 56" near Portopalo in Bark South. Then after a fortnight in Sicily all three sections of Nan Commando were embarked on two Landing Craft Tank for passage to Malta, arriving on July 27th and staying for a couple of days before onward passage on a Landing Craft Infantry (L) to Oued Marsa east of Bougie in Algeria for rest and recuperation, living under canvas with the British 4th Division. On August the 19th Nan Commando embarked on LCI(L) 241 for La Goulette, Tunis in Tunisia, before onward passage to Malta arriving in the Grand Harbour at Valetta on the 22nd of August 1943. The next day they set sail again for Catania thus returning to Sicily to take part in Operation Baytown the crossing to the Italian mainland. Eighth Army crossed the Straights of Messina on the night of the 2nd/3rd of September 1943, H Hour was 04:30 on the 3rd with Nan Commando landing at Gallico Marina just north Reggio di Calabria, subsequently another smaller landing was made at Sapri. Also in September Lt John Blakely Russell DSC RN was made Commanding Officer of Nan Commando. In October 1943, the unit moved to H.M.S Saunders at Kabret near Suez where it remained until it returned by cruiser to Italy for Operation Shingle, the Anzio Landings in January 1944. Nan Commando suffered their worst casualties at Anzio including Lt John Blakely Russell DSC RN, who lost a leg and was later awarded a Bar to his Distinguished Service Cross for courage, leadership and determination at Anzio. Later Lt Thomas Turton RNVR became CO and was promoted to Temporary Lt Cdr. Then after a period in Nisida Naples the unit moved to the Adriatic in June 1944 where it saw extensive service in the forward port areas with the 8th Army. Shortly after the war finished in Europe, in early June 1945 Lt Cdr Turton was injured in a road traffic accident and command of Nan Commando passed to Lt Alec Varley RNVR who then took Nan Commando back to the UK where they were eventually disbanded in November 1945 at Dundonald. In May 1945 there was an article featuring Nan Commando published in the Eighth Army News entitled "The Sea Devils" No.4 Vol 7 Monday the 14th of May 1945 and a transcription can be accessed here. R.N. Commando “N” by Lt Cdr M V Redshaw RNVR starts his account just as Tom Turton and he return from Operation Torch and follows his service with Nan Commando up to his draft prior to Anzio and then continues with his time with Q and K Commandos, appended are two timelines one Nan Commando as whole and one for N2 which cover the period from their formation up to Christmas 1943 also compiled by Lt Cdr Redshaw. Assistant Beachmaster Hugh Birley who joined RNBC Dog at Suez in the spring of 1943 and stayed with them until transferred to Nan Commando prior to Anzio and did not leave them until January 1945 wrote two sets of notes which I have combined with some details from letters into a single document, Hugh Birley Assistant Beach Master 1943-45. The late Syd Kipling who was with Nan Commando from when the unit was formed until he got married on May 30th 1945, after the war had ended. Leda his wife sent me a wonderful letter containing notes and photographs compiled and collected by Syd and Leda after the war. The letter has been split into four sections as it is quite a large document. Section 1 contains a covering letter and details of Lt Cdr Redshaw and Tom Turton in North Africa with G2 of Royal Navy Beach Party George. Section 2 contains photographs and notes from when Nan Commando was formed up to the end of Operation Baytown. Section 3 contains photographs and notes from their time at HMS Suanders to Anzio. Section 4 contains notes covering their time on the Adriatic Coast and disbandment with footnotes at the end. In the two books Beachhead Commandos by A. Cecil Hampshire and Beachhead Assault by David Lee there are a number of contributions from members of Nan Commando Ray Bromley, Syd Kipling, Lt Cdr Maurice Redshaw and Lt John Russell. There are also recorded interviews of Ray Bromley (Ref 17437), Syd Kipling (Ref 17346) and Gerry Pocock (Ref 27296) relating to their wartime service held at the Imperial War Museum. Also held at the IWM In the film archive, Admiralty Film ADM1250 has sections where members of Nan Commando appear including a section where a White Ensign with a smaller N3 flag below it is being raised in Sicily, a rehearsal landing at Salerno prior to Anzio and footage from the landing at Anzio. Also at the National Records Office at Kew is a letter from Lt John Russell to the Admiralty suggesting improvements to the Royal Naval Beach Commandos. This has been transcribed by Paul Seaton in the linked document. RNBC Peter was formed at Armadillo in April 1943 with Lt F.A.H Leake as senior Beach Master. They carried out various exercises until July 1943 when the unit together with Queen was prepared for some task which did not materialize. In September Peter Commando joined Force ‘J’ with whom it commenced training. Then in April 1944 Lt Cdr B.C. Lambert RNVR was appointed their commanding officer and on D-Day they landed as part of Operation Neptune with the assault troops of the 3rd Canadian Division on Juno Beach. In the picture (IWM A 24092), taken 13th of June 1944, are the commanding officer Lt Cdr B C Lambert, RNVR, of Bromley, Kent; Sub Lieutenant Parsey, of Bradford, Yorks; and Leading Seaman Springall, of Poplar, London. Peter Commando returned to HMS Armadillo in October 1944 where they were disbanded. As a result of Redshaw’s fall, at the end of April 1944 Lt Cdr George Phillips RNVR who had been awarded the Distinguished Service Cross at the Dieppe Raid in 1942 was appointed the new Commanding Officer of Queen Commando. At the time the commando was part of Force ‘G’ based around Portland and it was with them they were landed on Gold Beach in Normandy on D-Day June 6th 1944, one officer and two petty officers were wounded. The officer who was wounded was Lieutenant Ross Cramond RNZNVR (born in Brisbane 27 December 1919) was awarded a mention in despatches and the French Croix de Guerre. For leading his men with ‘great zeal till he was wounded.’ Also for his actions on D-Day and Lt Cdr George Phillips DSC RNVR was mentioned in despatches. Queen Commando returned to HMS Armadillo on August 22nd 1944 and from there proceeded to Lowestoft at the end of September 1944. Queen was disbanded at Armadillo on the 1st of March 1945 to provide personnel for LST and P/B Units etc. The unit was formed in September 1943 at HMS Armadillo. It was reported they did not show up too well in initial training and subsequent exercises because of the bad influence of a number of General Service ratings. The unit remained in Scotland at HMS Armadillo, Gailes Camp (HMS Dundonald I) at Inverary and HMS Brontosaurus at Castle Toward until July 1944 when they were moved to HMS Foliot in Devon. There they were designated Naval Party 1516 in October 1944 and moved to HMS Mylodon in Lowestoft in November 1944, a base used for Landing Craft Training for RM Commandos and Combined Operations. Designated Naval Party 4009 in December 1944 whilst still at HMS MYLODEN they then returned to HMS Armadillo on the 2nd of January 1945 prior to their embarkation for SEAC, South East Asia Command on the 5th, 7th of January 1945. Arriving in Bombay on the 2nd of June 1945. 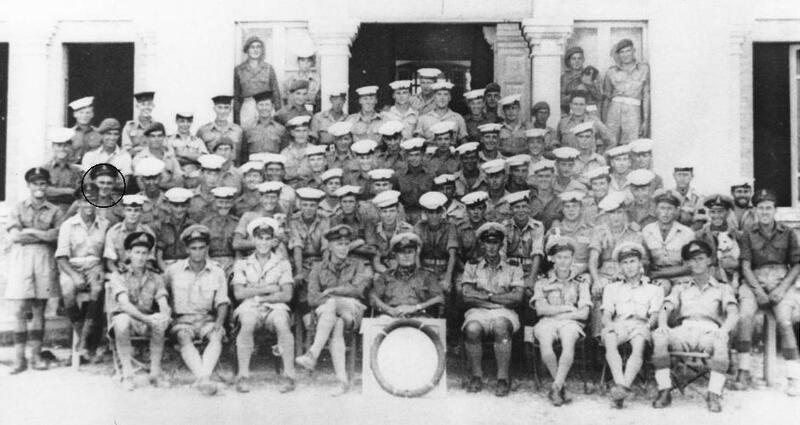 They were in Cocanada (Kakinada today) in July 1945, returning to Bombay on the 10th of August 1945. The Naval History records show the Naval party arriving in Madras on the 8th of September 1945 however the RN Beach Commando records indicate they took part in the Malaya Landings in September 1945. The Japanese in Malaya signed their surrender document on the 2nd of September 1945. The British then landed in Malaya on the 9th of September in the Port Swettenham area, as part of Operation Zipper. Able Seaman Alf Humberstone of 'U' RN Beach Commando recollects the landing in the book Beachhead Assault by David Lee, so at least part of the Commando was there possibly as part of the 46th Indian Beach Group. In October 1945 they were in Singapore but returned to Bombay in November 1945 where they were disbanded on the 15th of December 1945. Victor Royal Naval Beach Commando was formed in September 1943 at HMS Armadillo with Lt FM Hutton RNVR, Beach Master of V1 as Senior Officer. It was reported afterwards that under training the ratings of this unit proved exceptionally smart and keen as there were no General Service Able Seaman or malcontents from the big ships present. On completion of it’s training the unit was split into it’s sub-units whilst they carried out exercise commitments at Appledore, Burnham and Inverary. Then in April 1944 it was assembled as a unit again at HMS Armadillo under the command of Lt Cdr FM Hutton. It remained there except for a brigade training period at Inverary with the 52nd Lowland Division until the 10th / 11th of August 1944, when it proceeded to HMS Mylodon at Lowestoft as Naval Party 1517. Victor RNBC then proceeded overseas to SEAC on the 16th of September 1944 and had the designation Naval Party 4010 by December 1944. Elements of Victor RN Beach Commando may then have taken part in the Battle of Ramree Island south of Akyab. The battle was carried out by the Indian 26th Infantry Division and started on the 21st January 1945 with Operation Matador, an amphibious assault to capture the strategic port of Kyaukpyu located at the northern tip of Ramree Island, south of Akyab across Hunter's Bay and the key airfield near the port. Then on the 1st of May 1945 during Operation Dracular, at least elements of Victor RNBC were landed at Elephant Point. Possibly to aid the force landed to relieve the Gurkha airborne battalion dropped in to seize the point. The Allies then having realized the Japanese had virtually left Rangoon decided to go straight in the next day. Victor Royal Naval Beach Commando was also later involved in the Malaya landings in September 1945 after the Japanese surrender and spent some time in Singapore before the unit was disbanded in theatre on the 15th of December 1945.